Hero Nithiin’s film ‘A..Aa’ is gearing up for a big release this week. The movie has been directed by Trivikram, with Samantha playing the female lead. Wishes have been pouring in for Nithiin from all areas and today, he got a surprise from a most unexpected angle. 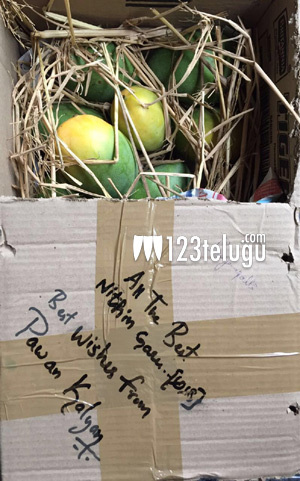 Nithiin’s favourite actor Pawan Kalyan sent him a box of mangoes grown at his farm. On the box, he also wrote a message wishing him the very best for the release of ‘A..Aa’. These wishes have thrilled Nithiin and he posted the photos on social media. Pawan Kalyan has a habit of sending boxes of mangoes from his farm to some of his closest friends and well wishers.